On routine endoscopy, esophageal duplication cysts can be identified via extrinsic compression of the lumen with normal appearing overlying esophageal mucosa. Endoscopically, these lesions may be indistinguishable from a lipoma, leiomyoma, a gastrointestinal stromal tumor (GIST), or other submucosal lesions. On EUS, esophageal duplication cysts will often appear as a periesophageal homogenous hypoechoic mass with multi-layered wall and well-defined margins, although sometimes the lesion can manifest as an anechoic cyst if considerable central fluid is present  [Figure 1]. The role of EUS-guided fine needle aspiration (FNA) in the diagnosis of esophageal duplication cysts, and duplication cysts in general, has been controversial. While FNA can show squamous cells or other cyst contents consistent with a duplication cyst that can aid in the diagnosis, the risk of infecting the cyst is a significant concern, with some studies showing an infection rate as high as 14%. , EUS-FNA should be performed if there is a concern about more serious lesion or if the nature of the lesion is in doubt. Endoscopic ultrasound-guided FNA is usually reserved for lesions of indeterminate appearance, lesions that are concerning for malignancy, and lesions that are atypical in appearance for duplication cysts. It should be noted that many duplication cysts can have an unusual appearance and can mimic other pathologic entities, including the malignant adenopathy. EUS-guided FNA may reveal a lesion felt to be a node to be, in fact, a duplication cyst. Even expert endosonographers can mistake a duplication cyst for a more ominous lesion, and aspirating a lesion of concern should not be considered a breach of the standard of care. Concerns regarding causing an adverse event following EUS-guided FNA of esophageal duplication cysts are well founded. Cevasco et al. reported a case in which a patient underwent EUS-FNA of an esophageal hyperechoic duplication cyst that subsequently got infected. The infected esophageal duplication cyst led to acute development and infection of a thoracic aorta pseudoaneurysm. Similarly, Trojan et al. reported a case of an infected hypoechoic esophageal duplication cyst after performing EUS-FNA on a paraesophageal mass concerning for persistent nonHodgkin's lymphoma (again showing how esophageal duplication cysts can mimic ominous lesions such as a malignant adenopathy). Although some authors advocate the use of antibiotics to help prevent infection, Diehl et al. reported one patient with infected esophageal duplication cysts due to EUS-FNA despite having received pre and postprocedure prophylactic antibiotics prior to the procedure. This patient subsequently underwent thoracotomy with cyst resection. Overall, EUS-guided FNA of duplication cysts should be avoided if the endosonographer has a high index of suspicion that the lesion in question really is a duplication cyst. In some cases, EUS-FNA may be warranted in order to characterize the lesion in question, but if a duplication cyst is discovered appropriate antibiotic coverage should be utilized. Symptomatically, patients with bronchogenic duplication cysts can present with dysphagia, chest pain, cough, shortness of breath, or abdominal pain. On EUS, these lesions often appear as round or oval lesion with a thin outer wall and located adjacent to the thoracic esophagus with well-defined endosonographic borders. Their intracystic contents can be anechoic, hypoechoic, or contain dense hyperechoic debris, which could be potentially confused with a soft-tissue masses or a malignant adenopathy  [Figure 2]. With regards to treatment, surgical enucleation is the treatment of choice in symptomatic cases. In asymptomatic cases, surgical resection has been suggested due to the rare development of complications or malignancy, but many of these lesions can be safely observed. Some experts also recommend close surveillance alone when the diagnosis has been confirmed by needle aspiration, but no standard regimen for surveillance exists. Indeed, consensus on whether these lesions need to be followed at all does not exist at this time. On EUS, duodenal duplication cysts can have a 3-5 layer wall consistent with cyst of intestinal origin, and the cyst's muscularis propria can be continuous with the muscularis propria of the duodenum. Duodenal duplication cyst can have an echogenic inner mucosa surrounded by a hypoechoic outer muscular layer. Until date, no data has been published on the utility of EUS-FNA in diagnosing small bowel duplication cysts. On EUS, colonic duplication cysts can show a "gut signature" which will manifest as a multi-layered wall, with a relatively hyperechoic inner layer produced by the mucosa surrounded by a relatively hypoechoic outer layer caused by smooth muscle, or can have a more irregular and atypical appearance  [Figure 4]. It should be noted that some cysts lack a well-organized layered wall due to some degree of involution or degeneration. The submucosa may be difficult to see and has no universally agreed upon appearance. 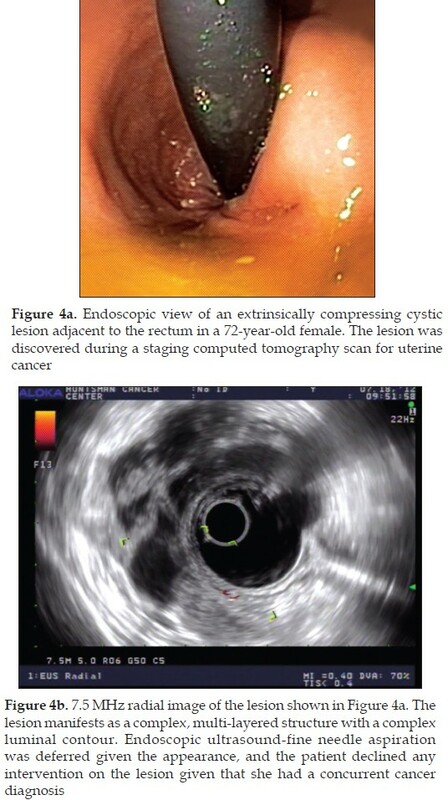 Peristalsis of the cyst wall has also been reported on EUS. Computed tomography scanning is also a highly sensitive diagnostic modality and is often the initial test of choice. Contrast enema can also establish the diagnosis if it can demonstrate a colonic filling defect or luminal communication with the bowel, but is much less commonly performed in the current era. Colonoscopy will show the duplication cyst only if there is communication with the colon or extrinsic compression and may fail to detect a significant number of colonic duplication cysts. To date, no data has been published on the utility of EUS-FNA in diagnosing colonic duplication cysts. Gastrointestinal duplication cysts are rare congenital lesions in adults. Some patients are asymptomatic while others can present with abdominal pain, bleeding, and abdominal pain. 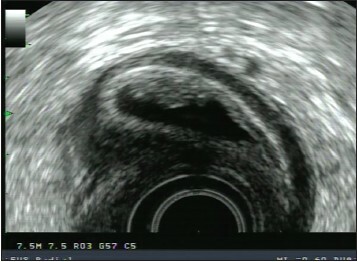 EUS can offer an accurate diagnosis of duplication cysts. EUS-FNA allows high-resolution morphologic analysis as well as sampling and microscopic examination of cyst contents; it can also lead to duplication cyst infection with associated complications despite pre and postprocedural antibiotics in some patients. EUS-FNA of duplication cysts can carry an increased risk of complications, but may be warranted to obtain a definitive diagnosis and to rule out more serious pathology. Once the diagnosis of duplication cyst is established, treatment can vary depending on the presence of symptoms. In symptomatic patients, surgical resection is often the choice for symptom relief. In asymptomatic patients, surgical resection is controversial. While some authors advocate for resection due to possible malignant degeneration of the duplication cyst, others have advocated for observation. Since there have been case reports of stable duplication cysts on EUS surveillance, this may be a suitable method of outpatient follow-up and surgical resection can be considered if patient develops symptoms. In any case, surgical versus nonsurgical management of asymptomatic duplication cysts is likely to remain controversial until we understand more about the time course and risk factors associated with their malignant degeneration. 1. Diehl DL, Cheruvattath R, Facktor MA, et al. Infection after endoscopic ultrasound-guided aspiration of mediastinal cysts. Interact Cardiovasc Thorac Surg 2010;10:338-40. 2. Nobuhara KK, Gorski YC, La Quaglia MP, et al. Bronchogenic cysts and esophageal duplications: Common origins and treatment. J Pediatr Surg 1997;32:1408-13. 3. Whitaker JA, Deffenbaugh LD, Cooke AR. Esophageal duplication cyst. Case report. Am J Gastroenterol 1980;73:329-32. 4. Snyder ME, Luck SR, Hernandez R, et al. Diagnostic dilemmas of mediastinal cysts. J Pediatr Surg 1985;20:810-5. 5. Bhatia V, Tajika M, Rastogi A. Upper gastrointestinal submucosal lesions - clinical and endosonographic evaluation and management. Trop Gastroenterol 2010;31:5-29. 6. Domajnko B, Salloum RM. Duplication cyst of the sigmoid colon. Gastroenterol Res Pract 2009;2009:918401. 7. Wildi SM, Hoda RS, Fickling W, et al. Diagnosis of benign cysts of the mediastinum: The role and risks of EUS and FNA. Gastrointest Endosc 2003;58:362-8. 8. Faigel DO, Burke A, Ginsberg GG, et al. The role of endoscopic ultrasound in the evaluation and management of foregut duplications. Gastrointest Endosc 1997;45:99-103. 9. Eloubeidi MA, Cohn M, Cerfolio RJ, et al. Endoscopic ultrasound-guided fine-needle aspiration in the diagnosis of foregut duplication cysts: The value of demonstrating detached ciliary tufts in cyst fluid. Cancer 2004;102:253-8. 10. Cevasco M, Menard MT, Bafford R, et al. Acute infectious pseudoaneurysm of the descending thoracic aorta and review of infectious aortitis. Vasc Endovascular Surg 2010;44:697-700. 11. Wang B, Hunter WJ, Bin-Sagheer S, et al. Rare potential pitfall in endoscopic ultrasound-guided fine needle aspiration biopsy in gastric duplication cyst: A case report. Acta Cytol 2009;53:219-22. 12. Arbona JL, Fazzi JG, Mayoral J. Congenital esophageal cysts: Case report and review of literature. Am J Gastroenterol 1984;79:177-82. 13. Geller A, Wang KK, DiMagno EP. Diagnosis of foregut duplication cysts by endoscopic ultrasonography. Gastroenterology 1995;109:838-42. 14. Pisello F, Geraci G, Arnone E, et al. Acute onset of esophageal duplication cyst in adult. Case report. G Chir 2009;30:17-20. 15. Bowton DL, Katz PO. Esophageal cyst as a cause of chronic cough. Chest 1984;86:150-2. 16. Neo EL, Watson DI, Bessell JR. Acute ruptured esophageal duplication cyst. Dis Esophagus 2004;17:109-11. 17. Trojan J, Mousset S, Caspary WF, et al. An infected esophageal duplication cyst in a patient with non-Hodgkin's lymphoma mimicking persistent disease. Dis Esophagus 2005;18:287-9. 18. Béchade D, Desramé J, Algayres JP. Gastritis cystica profunda in a patient with no history of gastric surgery. Endoscopy 2007;39 Suppl 1:E80-1. 19. Salo JA, Ala-Kulju KV. Congenital esophageal cysts in adults. Ann Thorac Surg 1987;44:135-8. 20. Noguchi T, Hashimoto T, Takeno S, et al. Laparoscopic resection of esophageal duplication cyst in an adult. Dis Esophagus 2003;16:148-50. 21. Versleijen MW, Drenth JP, Nagengast FM. A case of esophageal duplication cyst with a 13-year follow-up period. Endoscopy 2005;37:870-2. 22. Napolitano V, Pezzullo AM, Zeppa P, et al. Foregut duplication of the stomach diagnosed by endoscopic ultrasound guided fine-needle aspiration cytology: Case report and literature review. World J Surg Oncol 2013;11:33. 23. Khoury T, Rivera L. Foregut duplication cysts: A report of two cases with emphasis on embryogenesis. World J Gastroenterol 2011;17:130-4. 24. Kim DH, Kim JS, Nam ES, et al. Foregut duplication cyst of the stomach. Pathol Int 2000;50:142-5. 25. Bhatia V, Garg PK, Gupta SD, et al. Demonstration of peristalsis in gastric duplication cyst by EUS: Implications for diagnosis and symptomatology (with videos). Gastrointest Endosc 2008;68:183-5. 26. Seijo Ríos S, Lariño Noia J, Abdulkader Nallib I, et al. Adult gastric duplication cyst: Diagnosis by endoscopic ultrasound-guided fine-needle aspiration (EUS-FNA). Rev Esp Enferm Dig 2008;100:586-90. 27. Barr LL, Hayden CK Jr, Stansberry SD, et al. Enteric duplication cysts in children: Are their ultrasonographic wall characteristics diagnostic? Pediatr Radiol 1990;20:326-8. 28. Coit DG, Mies C. Adenocarcinoma arising within a gastric duplication cyst. J Surg Oncol 1992;50:274-7. 29. Murakami S, Isozaki H, Shou T, et al. Foregut duplication cyst of the stomach with pseudostratified columnar ciliated epithelium. Pathol Int 2008;58:187-90. 30. Kuraoka K, Nakayama H, Kagawa T, et al. Adenocarcinoma arising from a gastric duplication cyst with invasion to the stomach: A case report with literature review. J Clin Pathol 2004;57:428-31. 31. Horie H, Iwasaki I, Takahashi H. Carcinoid in a gastrointestinal duplication. J Pediatr Surg 1986;21:902-4. 32. Horne G, Ming-Lum C, Kirkpatrick AW, et al. High-grade neuroendocrine carcinoma arising in a gastric duplication cyst: A case report with literature review. Int J Surg Pathol 2007;15:187-91. 33. Ponder TB, Collins BT. Fine needle aspiration biopsy of gastric duplication cysts with endoscopic ultrasound guidance. Acta Cytol 2003;47:571-4. 34. Fazel A, Moezardalan K, Varadarajulu S, et al. The utility and the safety of EUS-guided FNA in the evaluation of duplication cysts. Gastrointest Endosc 2005;62:575-80. Erratum in: Gastrointest Endosc 2005;62:996. 35. Ryan AG, Zamvar V, Roberts SA. Iatrogenic candidal infection of a mediastinal foregut cyst following endoscopic ultrasound-guided fine-needle aspiration. Endoscopy 2002;34:838-9. 36. Sirivella S, Ford WB, Zikria EA, et al. Foregut cysts of the mediastinum. Results in 20 consecutive surgically treated cases. J Thorac Cardiovasc Surg 1985;90:776-82. 37. Kuhlman JE, Fishman EK, Wang KP, et al. Esophageal duplication cyst: CT and transesophageal needle aspiration. AJR Am J Roentgenol 1985;145:531-2. 38. Al-Harake A, Bassal A, Ramadan M, et al. Duodenal duplication cyst in a 52-year-old man: A challenging diagnosis and management. Int J Surg Case Rep 2013;4:296-8. 39. Chen JJ, Lee HC, Yeung CY, et al. Meta-analysis: The clinical features of the duodenal duplication cyst. J Pediatr Surg 2010;45:1598-606. 40. Al-Sarem SA, Al-Shawi JS. Ileal duplication in adults. Saudi Med J 2007;28:1734-6. 41. Tamvakopoulos GS, Sams V, Preston P, et al. Iron-deficiency anaemia caused by an enterolith-filled jejunal duplication cyst. Ann R Coll Surg Engl 2004;86:W49-51. 42. Ko SY, Ko SH, Ha S, et al. A case of a duodenal duplication cyst presenting as melena. World J Gastroenterol 2013;19:6490-3. 43. Gross RE, Holcomb GW Jr, Farber S. Duplications of the alimentary tract. Pediatrics 1952;9:448-68. 44. Li BL, Huang X, Zheng CJ, et al. Ileal duplication mimicking intestinal intussusception: A congenital condition rarely reported in adult. World J Gastroenterol 2013;19:6500-4. 45. Merrot T, Anastasescu R, Pankevych T, et al. Duodenal duplications. Clinical characteristics, embryological hypotheses, histological findings, treatment. Eur J Pediatr Surg 2006;16:18-23. 46. Wan XY, Deng T, Luo HS. Partial intestinal obstruction secondary to multiple lipomas within jejunal duplication cyst: A case report. World J Gastroenterol 2010;16:2190-2. 47. Guibaud L, Fouque P, Genin G, et al. Case report. CT and ultrasound of gastric and duodenal duplications. J Comput Assist Tomogr 1996;20:382-5. 48. Lad RJ, Fitzgerald P, Jacobson K. An unusual cause of recurrent pancreatitis: Duodenal duplication cyst. Can J Gastroenterol 2000;14:341-5. 49. Otter MI, Marks CG, Cook MG. An unusual presentation of intestinal duplication with a literature review. Dig Dis Sci 1996;41:627-9. 50. Johnson JA 3 rd , Poole GV. Ileal duplications in adults. Presentation and treatment. Arch Surg 1994;129:659-61. 51. Lee NK, Kim S, Jeon TY, et al. Complications of congenital and developmental abnormalities of the gastrointestinal tract in adolescents and adults: Evaluation with multimodality imaging. Radiographics 2010;30:1489-507. 52. Antaki F, Tringali A, Deprez P, et al. A case series of symptomatic intraluminal duodenal duplication cysts: Presentation, endoscopic therapy, and long-term outcome (with video). Gastrointest Endosc 2008;67:163-8. 53. Puligandla PS, Nguyen LT, St-Vil D, et al. Gastrointestinal duplications. J Pediatr Surg 2003;38:740-4. 54. Mourra N, Chafai N, Bessoud B, et al. Colorectal duplication in adults: Report of seven cases and review of the literature. J Clin Pathol 2010;63:1080-3. 55. Reiser-Erkan C, Erkan M, Ulbrich E, et al. Cystic colon duplication causing intussusception in a 25-year-old man: Report of a case and review of the literature. BMC Surg 2010 23;10:19. 56. Inoue Y, Nakamura H. Adenocarcinoma arising in colonic duplication cysts with calcification: CT findings of two cases. Abdom Imaging 1998;23:135-7. 57. Spottswood SE. Peristalsis in duplication cyst: A new diagnostic sonographic finding. Pediatr Radiol 1994;24:344-5. 58. Holcomb GW 3 rd , Gheissari A, O'Neill JA Jr, et al. Surgical management of alimentary tract duplications. Ann Surg 1989;209:167-74.